The American dream has been, for the longest time, to have a white picket fence surrounding a beautiful back yard. But is that the only option you have for using fencing as a décor? Fences have endless possibilities for making your back yard look gorgeous. You can do the traditional boundary fence or be creative with them. Awe your neighbors with your creative and amazing ideas. Make your yard look like the best one on the block. The traditional route refers to using a fence as a boundary from the next-door neighbor’s yard. 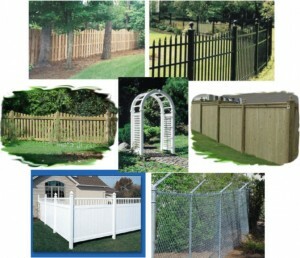 Most people wish for a white picket fence, but there are other types of fences as well to be used for this purpose. Many people also invest in wooden or stainless steel. Wooden fences can look very nice and include an old-fashioned, classic look for your yard. Wood used to be a very popular material for fencing, but it’s since gone to the back burner. Some homeowners are bringing that unique look back. Stainless steel can look sparklingly pretty too, and it’s a strong material that won’t wear down. Stainless steel not only looks great, but it’s durable and will last a long time. The best way to get your garden noticed is by surrounding it with a decorative fence. Fences can serve as an appealing border to your flower or herb garden. Instead of just portraying them out in the open, make people cast their eyes on your garden by placing a little fence around it. Another benefit to this idea is that fences will protect your garden as well as serve as a border décor. If you have young children or outside pets, you might run into the danger of getting your garden trampled. A miniature fence will serve as a barrier between people/pets and your lovely flowers. We normally consider a fence to serve the purpose of separating our house from the neighbor’s house, but why not place a fence in front of your house? Houses and front yards can look stunning with a fence placed in front of the sidewalk. If you are feeling really creative, you can include a gate leading to your entryway. This will add some beautiful character to your home as well as your yard. You can link a front fence to side fences in the yard, or just use a front fence as a decorative piece with a gate leading to your house. You can make your fence look especially attractive by planting flower and herb seeds on either side of it. Once the flowers or plants are fully grown, your face will bring your entire property to life. What better place to plant flowers than in and out of a fence? This is sure to capture plenty of attention from anyone who walks or drives by your house. People are drawn to flowers anyway, but you can make them stand out even more by including them with your fencing décor. My name is James Sullivan and I am a professional landscaper specializing in decorative fencing. I often use bamboo fencing as a nice addition to homeowner’s yards.